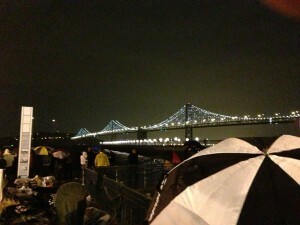 Thousands came to watch the debut of the Bay Lights—and the rain couldn't stay away either. On Tuesday night, artist Leo Villareal pressed laptop keys that illuminated a project two and a half years in the making. “Well here we are 1.8 miles long, 25thousand lights," he said. "Monumental public art. The lights will continue dancing along the bridge's western span for the next two years. The rain drenched San Francisco Mayor Ed Lee and Lt. Gov. Gavin Newsom, inverting their umbrellas, but couldn't dampen the enthusiasm of the spectators who flocked along the waterfront. Lights danced up and down the span's cables in endless variation. Villareal’s computer program will insure no sequences ever repeat over the two year life of the piece. Private donors are sponsoring the eight million dollar project, and powering the LED lights will cost just 30 dollars in electricity each night. Restaurants along the Embarcadero were packed. 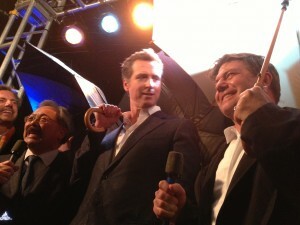 Those who couldn't watch in person had a chance to watch a webcast with Newsom interviewing dignitaries followed by a view of the lights. If you have no plans to be in San Francisco at night, you can still get a peek at the bridge through the project's live-streaming web camera.